Welcome! Ghettonation is the musings of Cora Daniels, an award winning journalist and author. I’ve spent almost 15 years writing first for newspapers, then magazines, and now books. A few of the places where my work has been published include The New York Times, Fortune, Essence, O: The Oprah Magazine, Heart & Soul and USA Today. I am also the author of two books Black Power Inc. and Ghettonation: A Journey into the Land of the Bling and The Home of the Shameless. Although I am political junkie and always have social issues on the mind, I’ve covered the business world for most of my career concentrating on workplace issues, culture, race, and general shadiness in high places. The result: a well informed, 30-something Black woman with a lot to say. 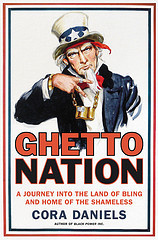 This blog is called Ghettonation, not only because it is the name of my new book (let’s be honest) but, unfortunately, it is also the world we are living in.